Hirsute songster Stapleton follows up 2015’s surprise blockbuster Traveler sounding world-weary. He hopes the preacher doesn’t visit his cell in “Death Row”; hopes his dealer didn’t get busted in “Them Stems”; ponders how his drunken past as “the Picasso of painting the town” makes his better half not trust him in the waltzing “Up to No Good Livin”; laments the unfortunate timing of her departure in an update of Willie Nelson’s “Last Thing I Needed, First Thing This Morning”. 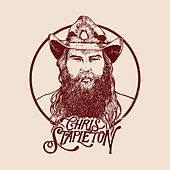 He choogles most of it as gruff, sepia-toned blues-country, with real-life better half Morgane Stapleton chiming in occasionally to add tension.